So you spilled red wine on your favorite blouse, shirt, pants or jacket. Whatever are you to do now? 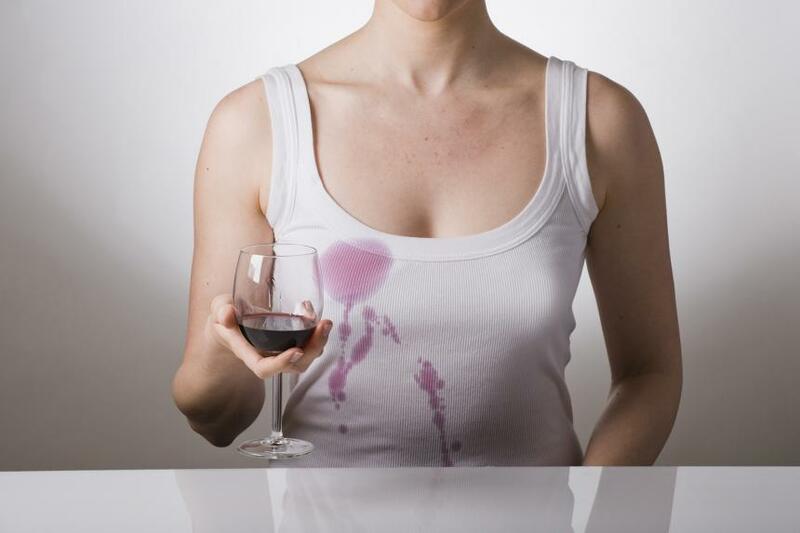 Your best shot at removing a red wine stain comes by responding quickly! First, address the stain as soon as possible. Don’t let it wait until tomorrow…or until the next time you make it to the dry cleaners. Address it immediately by blotting the liquid with a white cotton towel or a paper towel. Use white so there will be no chance of dye bleed from a colored towel. Blot it…don’t rub it. Rubbing can cause damage to the fabric, especially fabrics like silk and rayon. It can also cause the stain to set. If the garment is a dry clean only item, get it to your dry cleaner as soon as possible. Don’t try anything else on your own. You will likely cause more harm than good. If you have one of several commercial products for getting stains out, like Shout, first dilute the stain with water and blot as much of that as possible. Then apply the commercial product and let it sit overnight. Your next step is to wash it. Don’t place it in the dryer until you are satisfied that the stain is gone. Drying any garment will only cause the stain to set if it has not been effectively removed. If you decide to take this piece to the dry cleaner, be sure to tell the dry cleaner what you have already done to the garment. Be sure to talk with the professional dry cleaner who will be working on your problem...not only the Customer Service Representative. Communication with the dry cleaner is extremely important with any spill. Knowing the treatment you have used may affect the treatment from that point forward. If you have pre-treated the garment, you can still take it to the dry cleaner before washing it. With any product used in stain removal, it’s a good idea to test it in an inconspicuous place if time permits. If you decide to wash it yourself the next morning, follow the washing instructions on both the garment care label and on the stain product. If the instructions are in conflict, follow the garment care label. But what happens if you don’t have a commercial stain remover? Well, there are always home remedies you can try. There are several home remedies out there using fairly common household products, including club soda, white wine and baking soda. Removing any stain depends on several factors including the source of the stain, the fabric involved and any prior treatment. Sometimes these home remedies work and sometime they don't. And sometimes they make matters worse. So proceed with caution. Test first if possible. Club soda is perhaps the best known home remedy for red wine stains. Just moisten a clean cloth with club soda and then blot the stain. The carbonation should lift the stain right out. Another option in removing a red wine stain is white wine, which theoretically neutralizes the red wine. Pour a little white wine on the red wine stain and gently blot the area with a thick towel. Then wash the garment according to care label instructions…or take it to your dry cleaner. It would be my luck to end up with a red and white stain. I have never tested this one. Baking soda is another common household item that can help remove red wine stains. Be sure to first blot up as much of the stain as you can, then pour cold water on the stain and blot again. Continue the cold water and blotting routine until you cannot remove any more stain. Then apply a baking soda/water paste, let it dry, and then brush off the dried baking soda. If you have none of these common household products available, just add a little salt. Huh?? Theoretically (meaning, so we’ve heard...), salt prevents the stain from setting until you can get it to you dry cleaner or you can get a commercial product and treat it yourself. If you had no choice but to let the stain sit, you can try soaking such an older stain in a 50:50 solution of lemon juice and water OR vinegar and water. So there are plenty of home remedies you can try to remove stains, but your best success will almost always come though getting the garment to a professional stain remover at your dry cleaner. It's also important to understand that some stains cannot be removed. We've seen stains on dry clean only garments come right out when they were washed...but the fabric shrank, the buttons dissolved or the colors faded. We’ve also seen stains in garments that had been there for months or years come right out when given to the pros at Sudsy Water. For more information about laundry and dry cleaning pick-up services near you offered by Sudsy Water Laundry & Dry Cleaning, call 347-366-8079 or book reservations online 24/7!